Criminology, or the study of crime, has developed rapidly as a subject in recent years, while crime and the problem of how to respond to it have become major concerns for society as a whole. 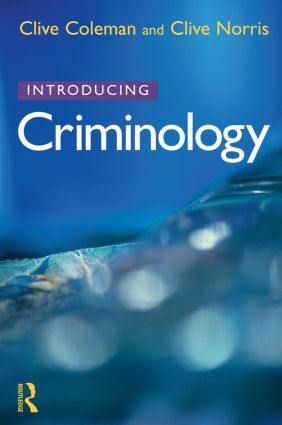 This book provides a succinct, highly readable - and much needed - introduction to criminology for those who want to learn more, whether they are already studying the subject, thinking of doing so, or just interested to discover what criminology is about. Introducing Criminology begins by asking basic questions: what is crime? what is criminology?, before examining the ways in which crime has been studied, and looking at the main approaches and schools of thought within criminology and how these have been developed. The authors focus particularly upon attempts to understand and explain crime by the disciplines of psychology and sociology, and consider also the impact of feminist and postmodern thought on the development of the subject. In the second part of the book the authors take three very different topics to illustrate themes raised in the first half of the book, exploring the particular issues raised by each topic, and showing how criminologists have gone about their work. Offenders and non-offenders: spot the difference?